After I had my second daughter I did an experiment. I went on a strict vegan diet for about 3 months to determine whether this would lower my cholesterol. At the time I was following a well respected MD; Dr Michael Gregor of Nutritionfacts.org. This was a time when I was learning a great deal about nutrition and I was engrossed by the science Dr. Gregor portrayed. So what happened on my little experiment? Well, I recall going to (not my usual) doctor and asking for a requisition to get my cholesterol checked. He said there’s no way eating a vegan diet for a few months would make a dent in my cholesterol levels and he pushed back, not wanting to give me the req. I believe my exact words to him were “either I get it from you or I get it from someone else”. He ended up giving me the req. And the results? My cholesterol dropped from 8.39 to 6.73, HDL remained the same, LDL dropped from 5.76 to 4.21 and total-to-HDL cholesterol dropped from 3.68 to 3.02. Did this turn me vegan? Not at all. In fact, as much as I admire Dr. Gregor and his plight I don’t advocate for a vegan diet for most people. This is because since doing this little experiment I have learned a great deal more than I knew back then when it comes to health and nutrition. And it should be noted that my health habits during this time greatly improved across the board AND I was eating a WHACK of coconut oil during this time, a saturated fat that the American Heart Association believes will raise your cholesterol. It’s also important to note that as of my last, recent checkup (I get my blood done very regularly) my total:HDL cholesterol is at 3.1, and I’ve been eating a omnivorous, paleo-ish, coconut oil and saturated fat-filled diet for a couple of years now. The reason I don’t advocate for veganism is another blog post in and of itself, but lets just say that even though my numbers dropped this didn’t necessarily make me healthier and in this post I will dispel the myths that still surround heart disease and cholesterol’s role in it. I grew up in an era – the 80’s and 90’s – when fat, and in particular saturated fat, was vilified. In these decades we were told that low-fat was the best option for our health and I recall consuming lollies by the handfuls assuming this was a healthier option for me and – more to the point at that time – my waistline. Boy, we couldn’t have been more wrong. Ancel Keys was the man behind the diet-heart-hypothesis, which promotes the idea that the consumption of saturated fat and cholesterol raises cholesterol in the blood, thus increasing the risk of heart disease. What he did was plot the dietary fat intake of six populations from various countries against their incidence of heart disease to show that the more fat people ate the more heart disease they got. This is what’s called an “observational study” – the least reliable type. What’s more, there was actually data available for 22 countries – not just six – but when you added in the rest of the countries the conclusion that dietary fat equaled heart disease isn’t very clear at all. Keys, it appears, cherry-picked six countries that made it seem like dietary fat may play a role in heart disease. Other studies promoting the diet–heart hypothesis originated with animal studies that seemed to suggest that dietary cholesterol could raise cholesterol levels in the blood, (it’s important to understand that animas biology can behave very differently to human biology, so animal studies are also not that credible). However, in recent times we have learned that the right types of fat are in fact crucial to our overall health, and that these fats, (including saturated fat) are not in fact dangerous to heart health when consumed in moderation. New studies including systemic reviews have shown that cholesterol in the diet does not increase the risk of heart attack. Another large meta-analysis involving close to 350,000 participants found no association between saturated fat intake and heart disease. And yet another Japanese study followed 58,000 men for an average of 14 years and also found no association between saturated fat intake and heart disease. In fact, this same study actually found an inverse association between saturated fat and stroke, (i.e. those who ate more saturated fat had a lower risk of stroke). Other studies have shown us that dietary cholesterol doesn’t appear to increase blood cholesterol levels in about 75% of the population. The other 25% might very well be the percentage I fall into known as “hyper-responders” whose blood cholesterol does moderately increase, (both LDL and HDL) when consuming cholesterol in the diet. In fact, low cholesterol is a dangerous thing. In one study of over 52,000 Norwegians, researchers found that women with total cholesterol levels below 195 mg/dL (5.0427 mmol/l) had a higher risk of death than women with cholesterol levels above that cut-off. And a study published in the American Journal of Medicine found that people over 70 years of age with total cholesterol levels below 160 mg/dL (4.1376 mmol/l) had twice the risk of death than those with cholesterol levels between 160-199 mg/dL (4.1376 – 5.14614 mmol/l). Depression has been shown to be 3 times more likely in men over the age of 70 who have low cholesterol than in those with normal to high cholesterol. Women with the lowest cholesterol have been shown to suffer significantly more depressive symptoms than other women in a Swedish study. Low cholesterol has been shown to be associated with increased risk of dementia. Low cholesterol has been linked to Alzheimer’s disease. (Note: all these studies were observational, but given what we know about cholesterol and it’s function in the body, the results of these studies are no big surprise). Additionally, according to the Institute for Functional Medicine, those with the highest levels of cholesterol were found to have an 80% decreased risk of dementia and a 48% reduction in mortality. And those with the lowest levels were found to have 350% increased risk of Parkinson’s disease. Your doctor may explain heart disease to you like this: the more cholesterol you eat, the more it will stick to your blood vessel wall and then your blood vessel will narrow, depriving your heart of blood, and that’s when you’ll get a heart attack. This is not correct and an overly simplistic view. It’s the degeneration of the lipoproteins that carry the cholesterol, and the destruction of plaque, that causes heart disease. When you go to the doctor and he or she tells you that you have high cholesterol what they’re looking at primarily is your LDL-C (the cholesterol within your LDL particles). LDLs are your lipoproteins, not actually your cholesterol. You see, cholesterol isn’t a fat. It’s a sterol, which is a combination of a steroid and alcohol. Cholesterol is fat-soluble but our blood is mainly water. In order for cholesterol to be transported around the body it needs to be wrapped in these lipoproteins, which are classified as either LDL or HDL – according to their density. HDL is High Density Lipoprotein and LDL is Low Density Lipoprotein. Lipoproteins are essential to our health. Not only do they carry cholesterol around the body but they also transport other nutrients to cells in the body such as fats, fat soluble vitamins such as vitamin A, D, E, and K, and coenzyme Q-10. Scientists used to believe that it was the amount of cholesterol inside these lipoproteins (known as LDL-C) that was a major risk for developing heart disease. And the cholesterol content of LDL particles can vary great. However, what we now know is that it’s actually the amount of lipoprotein particles (LDL-P) that matters most, rather than the total amount of cholesterol within these particles. When you go to your doctor they measure the concentration of cholesterol inside your LDL. But this isn’t the driving factor of heart disease: the amount of LDL particles in your bloodstream, is. And the blood tests your doctor runs don’t tell you what these particle numbers are. If you have too many lipoproteins in you bloodstream you run the risk of these penetrating your arterial lining. Essentially they will crowd each other out until some crash into – literally, into – the arterial lining. So we need to measure the amount of lipoprotein particles (LDL-P) in the blood, which is possible to do via functional practitioners such as myself. Familial hypercholesterolemia involves a gene that codes for apolipoprotein B (ApoB). Homozygous (2 copies of the mutatation) carriers are rare but can cause extremely high total cholesterol levels. Heterozygous (1 copy of the mutation) is more common. Inflammation and oxidation are the primary culprits when it comes to heart disease. It’s the oxidative destruction of polyunsaturated fatty acids in the membrane of the LDL particles that initiates an atherosclerotic plaque. And it’s the rupture of these plaques – not their formation – that drives heart attacks. (And this is why HDL is good: because it delivers vitamin E, (an anti-oxidant) to cells to help protect against the oxidation of LDL particles). When you develop plaque you form a layer of collagen around this plaque to help prevent the oxidized and inflammatory contents within this plaque from spilling out into the blood, (hence vitamin C is a crucial vitamin to prevent heart disease as vitamin C has a vital role in the production of collagen). And heart attacks are caused when these plaques rupture. What contributes to this? Inflammation, which can be measured by doing a C-Reactive-Protein blood test. Your doctor can run this for you for free. Another test that can give you even more valuable information about your inflammation is a fatty acid profile test. Only a practitioner who’s performing functional lab tests, such as myself, will run this fatty acids test. Oxidative stress, (which can be measured by a DUTCH test). Therefore diet and lifestyle strategies that will reduce your inflammation and oxidative stress are crucial to prevent or treat heart disease. Conventional medical treatment however, is to give a statin. Functional nutrition looks at how we can prevent the breakdown of atherosclerotic plaques such as focusing on collagen formation and reducing inflammation, reducing oxidation in the body such as supplying the diet with antioxidants, not drinking alcohol or smoking, etc. Bottom line: heart disease is about the degeneration of cholesterol not the amount of cholesterol in the blood. What we have to do is protect lipoproteins from degenerating if we want to prevent heart disease. And how does saturated fat play a role in this? Saturated fat can protect against oxidative stress because saturated fats are stable and not vulnerable to oxidation. Polyunsaturated fatty acids however, (such as those promoted by associations such as the American Heart Association) are delicate and vulnerable to oxidation. Monounsaturated fats are also fairy stable and hence they play a role in a heart healthy diet. The best test to date when it comes to assessing your risk for developing heart disease is your total-to-HDL cholesterol ratio. Abnormal is greater than 3. The longer LDL stays in the blood, the better chance it has to oxidize and the total-to-HDL cholesterol ratio is a marker for the amount of time LDL particles spend in the blood. As mentioned above, you also want to test your particle size. This is a test that a functional practitioner such as myself can run for you (your doctor likely won’t know how to run one). Heal your gut. Test for leaky gut and do a stool test, (again, only via a functional practitioner such as myself) to see whether or not you have any infections that need to be addressed. Balance blood sugar and insulin levels. This will promote weight loss, which will decrease LDL particle size. Additionally, a diet high in refined carbohydrates increases triglycerides and small LDL particles, decreases HDL, increases insulin resistance and obesity. My Balanced Blood Sugar Mama plan addresses this very issue. Eat a low carb diet. 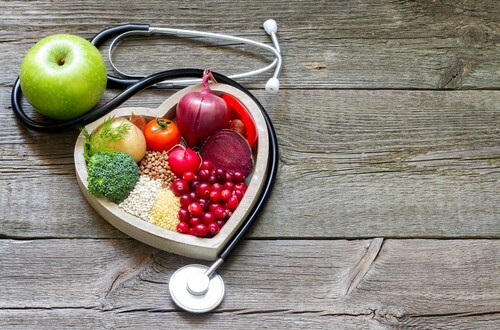 Studies have shown that low-carb diets improve heart disease risk factors including: decreasing triglycerides, blood glucose, BMI, abdominal circumference, insulin, and C-reactive protein. Carbohydrates also shift LDL particles to the more harmful dense type. Note however, there are some instances where a low carb diet wouldn’t be appropriate such as if you have familial hypercholesterolemia, adrenal issues, or thyroid issues. So ensure you work with a qualified health practitioner to determine if this type of diet is right for you. Test for Familial Hypercholesterolemia if you have extremely elevated cholesterol levels or if these dietary and lifestyle changes don’t work for you to reduce your cholesterol. Avoid vegetable oils, which are pro-inflammatory. These include canola, soybean and corn, and are mainly found in processed foods including things like salad dressings and mayonnaise. Eat heart-healthy fats including coconut oil, olive oil, avocados, avocado oil, animal fats in particular fatty fish such as wild salmon, and macadamia nuts. Don’t go to excess with these, but having them in the diet in moderation is beneficial: about 30 – 40% of calories should be from fat. Exercise can reduce LDL particle concentration even independently of diet. The benefits of exercise contribute to maintenance of body weight or weight loss, blood pressure control, return of insulin sensitivity, and beneficial changes in lipids, all of which promote heart health. Manage your stress. Stress will increase your chance of having a leaky gut, impaired blood sugar, depressed immunity, (which can increase your chance of infection), increases inflammation, and promotes the consumption of comfort foods – mainly carbs. Take liposomal vitamin C. This helps to support the production of collagen, which helps to protect your LDL particles from rupturing. Sleep deprivation has been associated with many cardiometabolic risk factors including imbalanced blood sugar, carbohydrate cravings, weight gain, insulin resistance, and increased appetite. Increase antioxidants. These help to prevent the oxidation of LDL particles. The way to increase your antioxidants is to simply “eat the rainbow” of fruits and vegetables. Try to eat as many colourful fruits and vegetables as possible – purple produce being one of the best to consume daily. If you want to go deeper when it comes to protecting yourself from heart disease please reach out to me. I can run all the relevant tests for you and devise a suitable protocol based on your own individual needs. Please note, I work virtually so it doesn’t matter where in the world you are in the world, I can help you (you just need Skype or FaceTime and then we’re good to go! ).